PHOENIX, Jan. 31, 2018 /PRNewswire-USNewswire/ -- Injured veterans, family members, and guests learned how to create favorite seasonal dishes with a healthy twist during a cooking class with Wounded Warrior Project® (WWP) at Fry's Food Stores. "My husband and I want to eat and live healthier during 2018," said Crystal Johnson, wife of Army veteran Matthew. "We've been to two classes and gained professional insight about what you can and cannot substitute in your regular dishes to make them healthier. 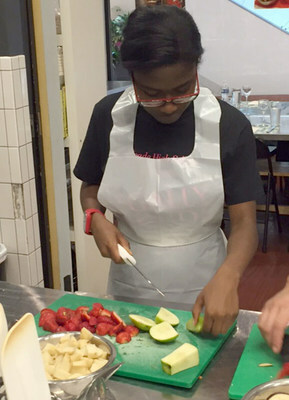 I loved this class because we weren't judged for what we do or don't know about cooking." Warriors and their guests learned how to make roasted organic chicken breast, mashed cauliflower, green beans with mushrooms and walnuts, roasted acorn squash with cinnamon, and pumpkin pudding. WWP program gatherings offer settings that provide opportunities for injured veterans to form bonds with one another, their families, and their communities. WWP also serves warriors by focusing on mental and physical health and wellness, financial wellness, independence, government relations, and community relations and partnerships. "My favorite part was just being there with my daughter and other vets," said Navy veteran Sue Goode. "It was great seeing them open up and have some fun. Wounded Warrior Project staff and the chefs were very friendly, open to questions, and willing to help with anything we needed." "To me, Wounded Warrior Project is a family," Crystal said. "You share a mutual bond, no matter if you are a vet or someone close to a vet. You have common ground to talk to people and network with them. We've met people we could be friends with outside of classes and events." In a survey of the veterans WWP serves (https://www.woundedwarriorproject.org/survey), four in five respondents registered with the organization for social engagements and support. In short, connecting veterans with fun opportunities gets them out of their homes, in places where WWP can help. To learn and see more about how WWP's programs and services connect, serve, and empower wounded warriors, visit http://newsroom.woundedwarriorproject.org, and click on multimedia.